Siddhartha Gautama was born into a Hindu Kshatriya family. Kshatriya (Hindi: क्षत्रिय, kṣatriya from Sanskrit: क्षत्र kṣatra) is one of the four varnas (social orders) in Hinduism traditionally responsible for the protection of the political-cosmic order (dharma) and the administration of society. Kshatriyas were the military and ruling class of the ancient Hindu society, who initially, acheived their class position on the merits of their aptitude (guna), conduct (karma), and nature (swabhava). However, over time, a Hindu's varna status became hereditary and rules surrounding class status were fixed in the Laws of Manu. Today, the Kshatriya varna includes a broad class of jati groups, differing considerably in status and function but united by their claims to rulership, the pursuit of war, or the possession of land. It is notable that several key figures in Buddhism, Jainism, and Hinduism were Kshatriyas, indicating the power and prestige that this group once held in ancient Indian society. Indeed, the famous religious leaders Gautama Buddha and Mahavira (as well as Lord Rama and Lord Krishna) all belonged to this social order. In addition to their religious impact, the Kshatriya class also played a very important role in the development of Indian political thought, penning key texts of political strategy such as the Arthashastra. In Sanskrit, the word "Kshatriya" is derived from kšatra, meaning "dominion, power, government" from a root kšī "to rule, govern, possess." Old Persian xšāyaθiya ("emperor") and xšaθra ("realm") are related to it, as are the New Persian words šāh ("emperor") and šahr ("city," "realm"). The Thai word for "king," kasat, and the Malay word for "knight" or "warrior," kesatria or satria, are also derived from it. The term denotes aristocratic status. In the early Vedic civilization, the warrior caste was called rājanya or kšatrīya. The former was an adjectival form of rājan "ruler, king" from a root rāj "to rule," cognate to the Latin rex "king," the German Reich "empire/realm," and the Thai racha "king." In Persia, the satraps, or "kshatrapa," were the governors, or "protectors," of the Persian Empire's provinces. According to Hindu mythology, the origins of the Kshatriya class can be explaned by several different theories. First, it is said that when the Hindu god Brahma was involved in the job of procreation due to toil and perspiration, a negative energy emanated from him. This negative energy took form of Rakshasas (Devils) Madhu and Kaitabha, evil and inhuman souls. They started torturing Brahma. Brahma appealed to Lord Vishnu who readily appeared and killed both of them. He explained to Brahma that when a positive energy is utilized, negative energy also emanates, and that a special race of humans should be created to protect the entire human race. Brahma acting on this advice sat down for meditation. At the end of the day four different forms of energy for the human race were formed out of Brahma's body. Brahmins were created at dawn, Kshatriyas at Noon, Vaishyas at dusk and Shudras at night. Note that these were the Varnas (colors) and not "caste" (Jati) as now thought of today. Usually this is told as Brahmins were born from Brahma’s head, ending with Shudras from the feet. In the Rig Veda the varnas were not rigid and were related to ones actions. The Brahmin varna was reddish as the sky before dawn, Kshatriya varna as the Sun at noon, Vaishya as the evening sky and Shudra the color of night sky. Gradually, the Varna system caught hold of Indian Sub Continent and each varna did its job as per guidelines of Brahma. Brahmins and Kshatriyas were the upper castes and Vaishyas and Shudras the lower castes. Both, Brahmins and Kshatriyas were allowed to study the Vedas. 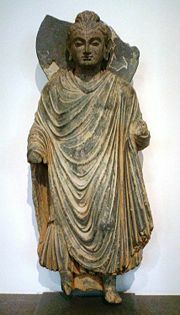 Kshatriyas (pronounced as shatria) also studied the ancient martial arts which were eventually carried by Buddhist monks like Bodhidharma (a Kshatriya) to China and Japan. The Brahmans and Kshatriyas and later the Vaishyas had to perform a communion ceremony called the Upanayanam (thread ceremony) that would symbolize their entry into the Aryan social structure and would be considered reborn, i.e dvijas (twice born). This meant that you accepted the Vedas as the word of God and were willing to perform the rituals and duties outlined under the guidance of your spiritual guide, the Brahman priest. The Rig Veda contains another Hindu story to explain the origins of the four classes of Hinduism. It is said that the universe began with the great sacrifice of the cosmic being Purusha. From its head (mouth) came the Brahmin class, and from its arms came the Kshatriya (warrior/ruling) class. Other classes came from its legs (Vaishyas) and feet (Shudras). As the warriors, the Kshatryas protected Hindu society whereas the Vaishyas pursued trade, while the Shudras performed menial chores of farming, labor, artisans, and all the jobs required of a society. In ancient India, there was mobility between varnas, as people learned new skills and changed their actions and occupations. The nomadic tribes of ancient India did not have a fixed caste system. They initially assigned roles based on an individual’s aptitude and ability. This was necessary in order to ensure the tribe's survival. The stronger members of the tribe became the warriors and were given higher status in society, as they were more important to the survival of the tribe at the time. As the tribes became more familiar with farming, they built up surpluses and settled. This more sedentary and leisurely lifestyle shifted the people's focus to accumulating wealth and finding a meaning to life. Priests began to take the preeminent role in society as they ensured spiritual salvation. This led to society forming a more rigid social system, where one's position was determined by birth rather than merit. Thereafter, those in the more powerful classes enforced this caste system to remain in power, a pattern also exhibited by the nobles of Europe. During the Epic Age, people began to question these institutions. Although the caste system was very fluid early on and an individual rose or fell depending on his own merit, historians generally agree that caste became hereditary around the time of the rise of Buddhism and Jainism based on archaeological, literary, and artistic evidence of the communities that existed in India. Gautama Buddha and Mahavira are two Kshatriya sages who made a lasting impression on the world. They did not believe in the preeminence of the Vedas and taught to the masses, not keeping spirituality to an elite few. Many of the ancient rulers such as Ashoka Maurya were ardent followers of this faith and promoted it throughout the Mauryan empire. This resulted in the decline in status of the Brahman order. Priests in all three faiths were the record keeper and as you will see in the coming examples there was a definite trend towards placing rulers in the Sudra varna if they did not follow Vedic teachings and maintain the prominence of the priestly order, losing their Kshatriya status. If a person possessed the qualities of purity, love, faith and detachment, seek true knowledge and have a spiritual temperament, they would be represented by the color White (sattva = truthful). Those that belong to this color, belong to the Brahman class. If a person possessed the qualities of action, will, aggression, and energy, seek honor, power, status and have a martial and political temperament, they would be represented by the color Red (rajas = energetic). Those that belong to this color belong to the Kshatriya class. If a person tried to seek communication, interchange, trade, business and possessed a commercial temperament they were represented by the color Yellow. They make up the Vaishya class. For those individual in society who showed ignorance, inertia, and dullness, they were represented by the color Black (tamas = inert, solid). Those belonging to this color are thought to be dependent on the rest of the world for motivation and seek nothing as they exist in those of the servile disposition and make up the Shudra class. 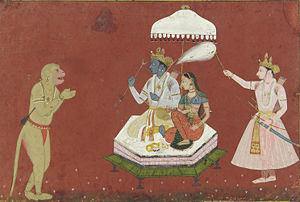 Lord Rama (center) with wife Sita, brother—Lakshmana and devotee Hanuman. Rama and Lakshmana are always shown to be ready for battle, with bow and arrow, as it is their Kshatriya dharma to fight. In classical Hindu society, the two primary tasks of the Kshatriya varna were to govern the land and to wage war. The latter task was the responsibility of the Raja (King), who was instructed by the Hindu texts to rule by the danda (staff) and inflict punishment (and war) upon enemies of the kingdom. These Hindu kings often ruled justly following the ideals found in their holy scriptures to govern as a Dharma-Raja (Just Ruler), with the main duties being protection of his subjects and livestock. These Kings also controlled large armies of other Kshatriyas who were employed as soldiers in pursuit of the Kingdom's protection, defence and expansion. However, these soldiers were not employees in a modern sense; rather they believed they were destined for their role as fighters. For the most part, it was seen as their intrinsic duty (svadharma). The major branches of Kshatriya varna are Chandravanshi, claiming descent from Chandra, Suryavanshi, claiming direct descent from Ramachandra and descent from Surya, Agnivanshi, claiming descent from Agni, and Nagavanshi claiming descent from the Nāgas. The Suryavanshi lineage claim descent from Surya—god of the sun. All present-day Suryavanshis also claim descent from the Hindu God Rama, who was himself born into a Suryavanshi dynasty. The Chandravanshi lineage is one of the three lineages into which the Kshatriya caste of Hindus is divided. According to legend, the Chandravanshis are descended from Chandra, in the Lunar Dynasty or the Hindu Moon God. The Yaduvanshi lineage are the major branch of the Chandravanshi lineage. The Yaduvanshis claim descent from Krishna, who in turn was born into a Chandravanshi dynasty. Several Indian castes such as Sainis, Rajputs of Bhati Clan, Jadaun Rajputs (Madhya Pradesh), and the Jats of Mathura/Bharatpur claim descent from the Yaduvanshi lineage. The Agnivanshi are people belonging to the Agnivansha. According to legend, they are descended from Agni, the Hindu God of Fire. The Agnivanshi lineage is one of the three lineages into which the Kshatriya caste of Hindus is divided. In South India, inscribed on the walls of the Vaithheswaran temple, is the Story of Horsemen coming out of Agni Homam conducted by Jambhuuva Maharishi to protect the earth (from Vatapi and Mahi garrisonning the world)is called Vanniyar Puranam. The Head of these horsemen was Rudra Vanniya Maharaja,descendants of whose five sons are called Vannia Kula Kshatriyas, famous among whom is Pallava king Narasimha Varman. Some Kshatriyas claim descent from the Nāga or the "serpent dynasty," and are called Nagavanshi. Some clans of Nair and Jat caste claim Nagavanshi descent. The Nagavanshi (or Nagabanshi) are known for ruling Chhotanagpur. Additionally, outside of India, the Ahom kings of Assam claimed descent from the Hindu god Indra (identified with Khunlung) and Syama (a low-caste woman), and called themselves Indravanshi (or Indravamsa) Kshatriyas. The Brahmavansha lineage descends from the Brahmavanshi king Chulki. The Vayuvanshi are another Kshatriya clan although not much is known about the clan. The Rexulvanshis are popular for being the kings of Surguja. The alien hordes that did not follow priestly customs or traditions (Shakas, Kushans, Indo-Greeks, Hunas, and Parthians) were stated as Vratya Kshatriyas in Manusmriti. Many historical rulers came from other castes, or were descended from non-Hindu foreign conquerors, and were either granted de facto Kshatriya status by virtue of the power they held, or they created fictionalized family histories to connect themselves to past Kshatriya rulers. For instance, the Sakas, Yavanas, Kambojas, Pahlavas, Paradas, and so on, were foreign invaders from the northwest, but were assimilated into the Indian community as Kshatriyas. Though the Ashtadhyayi of Panini (sutra 4.1.168-175) attests that the Kamboja and Gandhara were very important Kshatriya kingdoms of Uttarapatha during or prior to Paninian times (500 B.C.E. ), they came to be regarded as Sudras for not following the teachings of the Vedas. The Manusmriti, written about 200 C.E. states that the Sakas (Scythians), Yavanas (Ionian, Indo-Greeks), Kambojas (Central Asians), Paradas (Sinkiang), Pahlavas (Persians), Kiratas (Nepal, Assam), Dravidas, Thevar (Tamil), and Daradas were originally noble Kshatriyas but were relegated to the Barbaric (Vrishala) status due to their neglect of the Brahmanas as well as due to their non-observance of the sacred Brahmanical codes (X/43-44). Anushasanaparava of the Mahabharata also views the Sakas, Kambojas and the Yavanas. in the same light. Patanjali in his Mahabhasya regards the Sakas and Yavanas as pure Sudras (II.4.10). The Vartika of the Katyayana informs us that the kings of the Sakas and the Yavanas, like those of the Kambojas, may also be addressed by their respective tribal names. The Mahabharata also associates the Sakas, Yavanas, Gandharas (Northwest India), Kambojas (Pamir-Badakshan), Pahlavas, Tusharas, Sabaras, Barbaras, Dravidas, and Boyars, and so on, and addresses them all as the barbaric tribes of Uttarapatha. The Kishkindha Kanda of the Ramayana locates the Sakas, Kambojas, Yavanas, and the Paradas in the extreme north-west beyond the Himavat (that is, Hindukush) (43/12) in the Shakadvipa, adjoining the land of Uttarakurus. The Udyogaparava of the Mahabharata (MBH 5/19/21-23) tells us that the composite army of the Kambojas, Yavanas and Sakas had participated in the Mahabharata war under the supreme command of Sudakshina Kamboja. The epic repeatedly applauds this composite army as being very fierce and wrathful. Some verses of Mahabharata also attest that the Tusharas or Tukharas were also included in the Kamboja division (for example, MBH 6.66.17-21; MBH 8.88.17). Puranic accounts attest that the Dravidas are Kshatriyas and are said to be descendants of the sons of Vishwamitra. Like the Kambojas, Sakas, Yavanas, Daradas, Khashas, and so on, the Dravidas were recorded as Kshatriyas who no longer were initiated into the sacred thread due to their neglect of the Brahmanas as well as due to their non-observance of the sacred Brahmanical codes. Within the complex and multifaceted world of Hindu symbolism, the Kshatriyas class is represented by the Nyagrodha Banyan tree and the danda (staff). When a Kshatriya undergoes his initiation ceremony, a "staff made of [the aforementioned] wood is given to the Kshatriya initiate with a mantra imparting physical vitality or 'ojas'". ↑ SCU, The Caste System in India. Retrieved September 16, 2008. ↑ K.M. George, A Many Branched Tree: Perspectives of Indian Literary Tradition (1991). ↑ Brian K. Smith, Reflections on Resemblance, Ritual, and Religion. Chakravarti, P.C. The Art of War in Ancient India. Delhi: Oriental Pub., 1972. ISBN 978-8175363038. Dikshitar,V. Ramachandra. War in Ancient India. Motilal Banarsidass, 2004. ISBN 978-8170208945. George, K.M. A Many Branched Tree: Perspectives of Indian Literary Tradition. Ajanta Publications, 1992. ISBN 978-8120203341. Sarkar, Jagadish Narayan. The Art of War in Medieval India. New Delhi; Munshiram Manoharlal Publishers 1994. ISBN 978-8121501118. Smith, Brian K. Reflections on Resemblance, Ritual, and Religion. Motilal Banarsidass, 1998. ISBN 978-8120815322. This page was last modified on 23 January 2018, at 21:11.